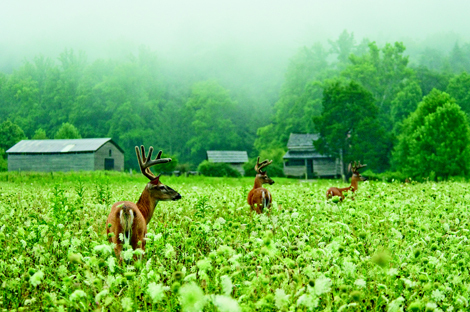 Cades Cove: Each year, millions of visitors pass through this scenic valley in Great Smoky Mountains National Park to marvel at the wildlife that roams free. Get a glimpse of what awaits with this collection of photographs that capture one lensman&rsquo;s breath-taking encounters. In the faint hours of morning, photographer Brian Shults makes the hour-long drive from his home to reach Cades Cove when the wildlife is stirring and light is golden. Once there, he slips on his pack full of camera equipment, straps a tripod to his bike, and sets off to shadow bears, deer, coyotes, and wild turkeys, and hone in on the birds, butterflies, and other small creatures that dwell in this 6,800-acre valley in Great Smoky Mountains National Park. Often he is among throngs of travelers who flock to this spot, the most visited area in the park, where majestic peaks and historic structures built by early settlers serve as a backdrop for animal encounters. While driving the 11-mile loop that circles this cove, wildlife sightings are almost guaranteed. But those who leave their cars behind and opt to explore on foot, bike, or horseback are rewarded with more intimate, awe-inspiring moments, like those captured by Shults.